Every athlete takes a different path to the Olympics. Some do it for the fame and glory. Others compete out of love for their country. In 2008, Jason went to the Summer Olympics in Beijing to have fun and make friends. But he has a very different mission at the 2010 Winter Olympics in Vancouver, Canada. Watch the video to find out what it is! Jason: I was just out bowling with my friends, and I left. They continued bowling. And, apparently, some crazy stuff happened after I left, because I got a very strange voicemail that I want you to listen to. Voice: Jason, we have kidnapped your friends. If you want to see them again, bring your gold medal to the bowling alley. Jason: So, it looks like I’m going back to the Olympics, because despite all my experience in Beijing long jumping, bicycling, badminton, I came away without a gold medal. And if that’s the only way to get my friends back, I’ve got to go to Vancouver and get one. So I’m putting together a new suit here for the Winter Olympics. It’s gonna help me go for the gold. When you go for the gold, you try as hard as you can to get the very best thing. You don’t want silver or bronze, ‘cause that’s not gonna rescue my friends! So I’m ready. Here we go. Vancouver 2010, this is English, baby! going for the gold! Jason and his friends were at the bowling alley, and Jason decided to leave. After he was gone, somebody kidnapped all his friends! The kidnapper leaves a message on Jason’s phone telling him he has to bring him an Olympic gold medal if he ever wants to see his friends again. Jason is no stranger to the Olympics. He went to the Summer Olympics in Beijing in 2008. But the one thing he didn’t do there was win any gold medals. So Jason decides to go to Vancouver to try to earn a medal at the Winter Olympics. He even makes himself a special suit to help him go for the gold. 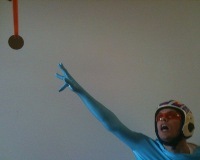 Stay tuned for more Olympic videos, and find out if Jason is able to rescue his friends! Have you ever gone for the gold before? Did you succeed? very interesting and go for the GOLD gohead. Interesting! I liked this lesson. I really like Jason’s lessons! how can i listen and watch the lesson? Jason is a very good friend. He had resqued his friends then they were kidnapped. He had to bring a gold medal from Winnter Olimpic Vancouver , to bowling alley by your home….and he made that…Jason has his friends again.